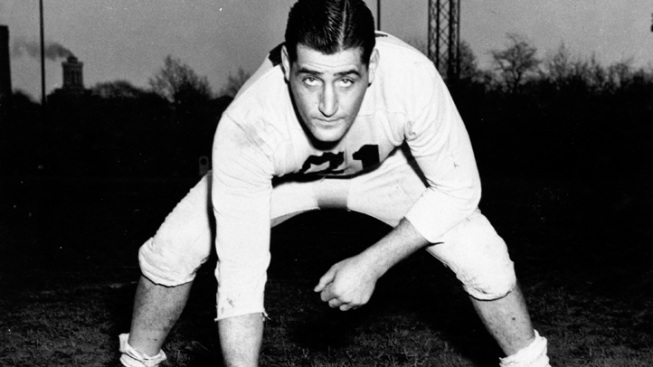 FILE - In this 1942 handout photo, football player Chuck Cherundolo is shown. Cherundolo, the former Eagles & Steelers center and NFL coach has died in Florida at the age of 96. Former Penn State and Eagles center Chuck Cherundolo who would go on to become a Pro Bowler with the Steelers and coach in Pittsburgh has died in Florida at the age of 96. Cherundolo died of heart failure on Dec. 22 in Lakeland, his daughter said Saturday. Cherundolo played for the Steelers in the 1940s, taking a break to serve in the Navy during World War II. In 2007, the Steelers named him to their legends team, representing the franchise's best players through 1970. Born in Old Forge, Pa., he played football at Penn State University before beginning his professional career with the Cleveland Rams. He played for the Philadelphia Eagles for one season (1940) before joining the Steelers for the rest of his career. Cherundolo also coached in the NFL through the 1970s. His daughter says he was amazed by improvements in safety gear and players' salaries over the years.